Torogan (lit. "resting place" or "sleeping place"), is a traditional house built by the Maranao people of Lanao, Mindanao, Philippines. A torogan was a symbol of high social status. Such a residence was once a home to a sultan or Datu in the Maranao community. Nowadays, concrete houses are found all over Maranaw communities, but there remain torogans a hundred years old. The best-known are in Dayawan and Marawi City, and around Lake Lanao. A torogan is elevated above the ground by columns cut from trees of huge girth. Its walls are covered with plywood sticks and the roof thatched with dried coconut leaves. There is no interior partition, so it appears as a huge hall. Apart from the basic elements of this structure, it is intricately engraved with the flowing geometries of the Maranaw design system called okir. A torogan is not complete without the legendary bird Sarimanok being displayed inside. Furniture is also common among Maranaws. 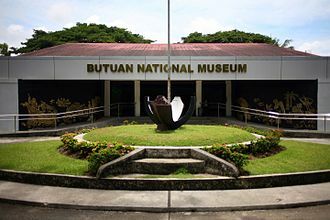 The Kawayan Torogan, built by Sultan sa Kawayan Makaantal in Bubung Malanding, Marantao, Lanao del Sur, the last remaining habitable torogan, was declared as a National Cultural Treasure by the National Museum of the Philippines in 2008. There are also existing torogans in various locations in Lanao such as the Dayawan Torogan of Marawi and Laguindab Torogan of Ganassi. All are in need of massive funding for their rehabilitation. These collection of torogans from various towns in Lanao are being pushed to be included in the tentative list of the Philippines in the UNESCO World Heritage List. The owner of the controversial Las Casas Filipinas de Acuzar have bought and transported two ancient habitable torogans from Lanao into Bataan province in Luzon, sparking outrage from conservation groups. ^ Madale, Abdullah T. (July 1997). The Maranaw Torogan (2nd ed.). Manila, Philippines: Rex Bookstore. ISBN 971-23-2017-0. ^ Alba, Reinerio (July 22, 2008). "National Museum Declares Maranao Torogan as National Cultural Treasure; Torogan Needs Immediate Rehabilitation". National Commission for Culture and the Arts. Archived from the original on September 7, 2014. Retrieved September 4, 2014. Bataan is a province situated in the Central Luzon region of the Philippines. Its capital is the City of Balanga, occupying the entire Bataan Peninsula on Luzon, Bataan is bordered by the provinces of Zambales and Pampanga to the north. The peninsula faces the South China Sea to the west and Subic Bay to the north-west, the Battle of Bataan is famous in history as one of the last stands of American and Filipino soldiers before they were overwhelmed by the Japanese forces in World War II. The Bataan Death March was named after the province, where the march started. In 1647, Dutch naval forces landed in country in an attempt to seize the islands from Spain, the Dutch massacred the people of Abucay in Bataan. Bataan featured prominently during World War II, prior to the 1941 Japanese invasion, the US Army stored nearly 1,000,000 US gallons of gasoline there. Japanese forces started a siege of the peninsula on January 7,1942, and launched an assault on April 3. The majority of the American and Filipino forces surrendered on April 9 and were forced to more than a 100 kilometres from Bataan to Capas-Tarlac. 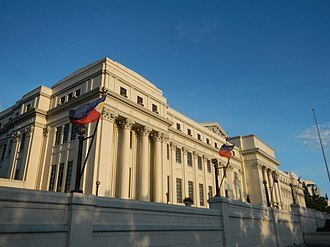 The Administration of President Rodrigo Duterte is currently pushing for federalism in the country, scholars in the region have suggested naming the state the State of Luções, named after the historic collective name of the people of Luzon. 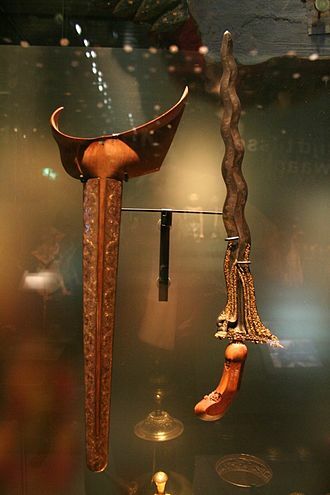 During precolonial times, when the power of the kingdoms in present-day Metro Manila was declining, the people of Myanmar, Timor, Luções were known as skilled mercenaries and even battle soldiers. They aided in the war campaigns of Myanmar, when the Spanish came and stormed Luzon, the ties of the Luceos with their ally countries were cut and the Luções were turned into commoners and indios by the Spaniards. 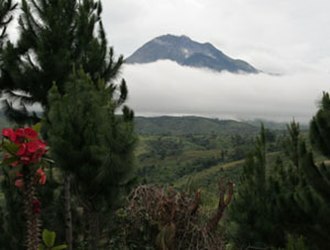 At the northern portion of the peninsula is Mount Natib and its mountains, separated from Mount Samat. A narrow coastline plain characterizes the eastern portion of the province, while the western coast features many ridges, Bataan is politically subdivided into 11 municipalities and one component city. The population of Bataan in the 2015 census was 760,650 people, various religious groups are subscribed to by the people but Roman Catholicism is the predominant religion, comprising 85% of the Bataan population. The university is run by the Order of Preachers. The patron of the university is St. Thomas Aquinas, while St. Catherine of Alexandria is the patroness, the university is composed of several autonomous faculties, colleges and institutes, each conferring undergraduate and postgraduate degrees, and the basic education units. Several degree programs have been accredited by the Commission on Higher Education as Centers of Excellence, moreover, it was awarded with an Institutional Accreditation by the CHED through the Federation of Accrediting Agencies of the Philippines. Prominent Thomasians include saints, Philippine presidents, artists, scientists and religious figures, the athletic teams are the Growling Tigers, who are members of the University Athletic Association of the Philippines and are consistent winners of the Overall Championship. The foundation of the University is ascribed to Miguel de Benavides and he came to the Philippines with the first Dominican mission in 1587. He went on to bishop of Nueva Segovia, and was promoted archbishop of Manila in 1601. Upon his death in July 1605, Benavides bequeathed his library, Bernardo de Santa Catalina carried out Benavides’s wishes and was able to secure a building near the Dominican church and convent in Intramuros for the College. In 1609, permission to open the College was requested from King Philip III of Spain, on April 28,1611, notary Juan Illian witnessed the signing of the act of foundation by Baltasar Fort, OP, Bernardo Navarro, OP, and Francisco Minayo, OP. Fort, appointed that year to the post of Father Provincial, the Colegio de Nuestra Señora del Santísimo Rosario was established on April 28,1611, from the Benavidess library. Later renamed Colegio de Santo Tomás, it was elevated by Pope Innocent X to a university on November 20,1645 in his brief and this makes the institution the first in the islands to be formally elevated to the status of university. Its complete name is The Pontifical and Royal University of Santo Tomas and this makes the UST the first and only formally declared royal and pontifical university in the Philippines. The university was located within the city of Intramuros in Manila. The first courses offered by the Colegio de Santo Tomás were canon law, philosophy, grammar, the arts, in 1871, it began offering degrees in Medicine and Pharmacy, the first in colonized Asia. Also that year, it began accepting female enrollees, in the last four decades, the university grew into a full-fledged institution of higher learning, conferring degrees in law and various academic letters. The university has graduated Philippine national heroes and even saints, the Medicine and Civil Law courses were retained in Intramuros at that time. 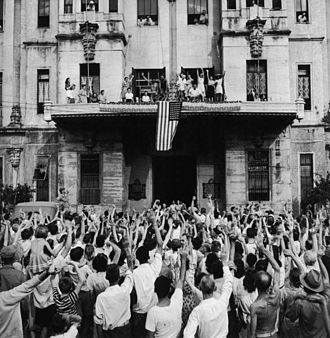 During World War II, the Japanese forces converted the Sampaloc campus into an internment camp for aliens, mostly Americans. The original Intramuros campus was destroyed in 1944 by an arson created by the Japanese Kempeitai, more than 4,000 foreigners survived under difficult conditions in the internment camp for 37 months from January 1942 until February 1945 when the camp was liberated by American soldiers. Andrés Bonifacio fought for independence from the politically and socially ruthless colonial rule by Spain. The monument 45 feet in height with symbolic images and other known as the Cry of Pugadlawin is acclaimed as one of the best monuments in the world. The Bonifacio Monument recalls the Philippine Revolution which was spearheaded by Andrés Bonifacio who had urged his men to raise against the rule of Spain. His call to arms against the Spanish rule was given on 23 August 1896. The foundation stone for the monument was laid by Aurora Quezon. The monument, which was created under the orders of Frank Murphy, on 30 November 2013, the sesquicentennial of birthday of Andres Bonifacio and the 80th anniversary of unveiling of the landmark monument to the Father of the Nation was celebrated. It is crowned by a figure with wings representing triumph, below the vertical pylon 20 figures cast in bronze have been molded over an octagonal shaped plinth, plus one angel of peace at the top. The octagon represents the eight provinces who fought against Spain and represents eight rays of the Katipunan flag, the plinth is raised in three steps, each step representing the three centuries of Spanish rule. Cape Bojeador Lighthouse, known as Burgos Lighthouse, is a cultural heritage structure in Burgos, Ilocos Norte, that was established during the Spanish Colonial period in the Philippines. It was first lit on March 30,1892, and is set high on Vigia de Nagpartian Hill overlooking the scenic Cape Bojeador where early galleons used to sail by, the light marks the northwestern-most point in Luzon. 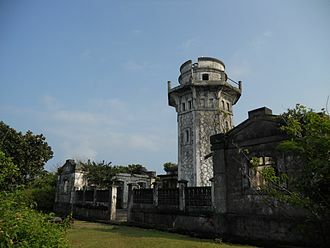 The northeastern-most being Cape Engaño Lighthouse on Palaui Island, Santa Ana, the 66-foot-tall octagonal stone tower, the most prominent structure in the vicinity, can be seen from as far away as Pasuquin town in the south and Bangui on the east on a clear day. Contrary to popular belief, it is not the highest-elevated nor tallest lighthouse in the Philippines, but the highest elevated still original and active Spanish era lighthouse in the country. 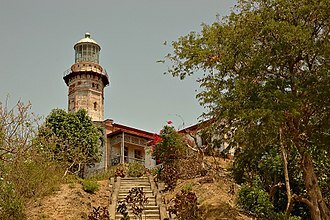 Corregidor Lighthouse is higher at over 600 feet, and among the Spanish Colonial lighthouses, in Mindoro Strait, the recently erected modern tower at the Apo Reef Light Station rises to a height of 110 feet. The Cape Bojeador lighthouse was part of the Spanish governments master plan of illuminating the Philippine archipelago, the project commenced with the execution of the lighthouses in the northern and western part of the Philippines and those around Iloilo and Cebu. The Burgos lighthouse was first lit on March 30,1892, the lighthouse was first designed by Magin Pers y Pers in 1887 and was finished by the Lighthouse Service under Guillermo Brockman. It is typical of the Spanish Colonial lighthouses which is all made with bricks that are widely used and produced in the area. The octagonal tower is topped with a cupola and the viewing gallery is surrounded by decorative iron grill works. The lighthouse was fitted with first-order Fresnel lens. The intense earthquake of 1990 that hit most of Luzon damaged the lenses, the beam now comes from a modern electric lamp that is powered by solar panels. The light before was provided by pressurized kerosene lamps very much like Coleman lamps, in 2005, the old pressure vessels and wicks for the light could still be found in the shed. Half of the current structure, the side facing the UST Main Building is the ruins of the original Intramuros arch while the side that faces España Boulevard is a replica. The Arch of the Centuries was originally erected around 1680 at Intramuros, after World War II, the university transferred to its present location at Sampaloc. The Arch was carried piece-by-piece and was re-erected at the present Plaza Intramuros in 1954, the original Arch which faces the Main Building was the main doorway to the university building before it was destroyed during World War II when it was at Intramuros. A newer arch faced España Boulevard, which is a reconstruction of the original arch, the Arch contains Doric columns, but is Baroque in its details. The inscription on the arch says Gateway to the history of the finest breed of Filipinos, on the sides at the top of the Arch are panels depicting the life of Saint Thomas Aquinas, the patron saint of the university and of all Catholic educational institutions. The St. James the Apostle Parish Church commonly known as Betis Church is a Baroque church located in the Betis, Guagua in Pampanga, Philippines under the Roman Catholic Archdiocese of San Fernando. The church was established in 1607 and dedicated to Saint James and it was declared a National Cultural Treasure by the National Museum and the National Commission for Culture and the Arts. The baroque-inspired Betis Church was built around 1660 under Father José de la Cruz, the preliminary structure was made out of light materials which was composed mainly of wood and stucco. Fire broke out within the several times due to these light materials so it was finally built with concrete materials in 1770. On the other hand, the present-day concrete fence with caryatids was built in the 2nd quarter of the 20th century, in 1908, the rectory of the church was burned with fire and all the documents about baptism and other historical catalogues of the church turned into ashes. Beautification of the part of the church was extensively done by the last Spanish priest named Father Santiago Blanco in 1939. The interior ceiling was painted by the famous, Anac Baculud, who was mentored by Dr. Sijuco. Isidoro, nicknamed Doro Soto, actually painted the artwork on the ceiling itself, during the Spanish-Colonial period, Betis is an independent town which has its own autonomy as a municipality. But due to migration of its inhabitants to the nearby Guagua in the American Period, although part of the municipality of Guagua, the Betis church has its own parochial priest and has its patron saint named St. James the Great. Betis as a town traces its roots way before the period of Spanish colonization which began in the 16th century, the town already had a unique culture and way of life prior to Spanish occupation. People here were well-known carvers and expert in trade and this talent and expertise would be used by the colonizers to infuse western influences to the natives of Betis. The word Betis was derived from Hispania Baetica or Hispania Baetica-an ancient place during the Roman Period which was located at the Iberian Peninsula and this Iberian Peninsula is now present–day Spain. Las Casas Filipinas de Acuzar is an open-air museum and heritage park in Bagac, Philippines. Las Casas Filipinas is by the sea, along Umagol river, in Barangay Pag-asa, josé Gerry Acuzar, owner of New San Jose Builders started to rebuild Spanish mansions in Bagac in 2003. Each was dismantled brick by brick, transported to his property in Bagac, reassembled in the same order, houses were chosen based on their historical and architectural value. Acuzar bought houses that were in a state of neglect, from the owners, in 2010, the heritage park was opened to public. Spread over 400 hectares, the features a collection of 27 Spanish Colonial buildings. These houses were dismantled, transplanted from around the Philippines. For parts that were missing and bricks were replicated to resemble the original structure, for this, the Ciudad employs a workforce of 130 people, including 10 wood sculptors, three metal sculptors,30 craftsmen who design ceilings, and construction workers. There are five architects, two of whom are historical architects, and two artists The resort has a restaurant, a beach, calesa rides and a swimming pool and it plans to have 50 such heritage houses. Las Casas Filipinas de Acuzar contains 30 heritage houses, the house contains wood carvings with floral motifs. The original owner of Casa Baliwag was Kapitan Fernando Vergel de Dios, it was inherited by his eldest daughter and it was originally across the towns San Agustin church. Family members fondly called it Luwasan since it was the house referred to when going towards the town or to Manila, Kapitan Fernando had another house called Hulo, which was going towards the end of town, or sa dulo. Casa Baliuag 2 was an originally in the compound of Iglesia ni Cristo in Baliuag. It was owned by a Gonzalez, Casa Cagayan is a collection of four wooden houses built on stilts. Such houses were regarded as those of poor people in Cagayan in the early 1900s. Casa Candaba was home to the Spanish governor general whenever he visited Pampanga, two houses from Jaen, Nueva Ecija, originated from the Esquivel clan. Casa Lubao served as storage for rice and sugar, and became a Japanese garrison during World War II. The Saints Peter and Paul Parish Church, commonly known as Calasiao Church is a baroque church located in Poblacion West, Pangasinan, Philippines. It belongs to the Vicariate of Sts and Paul under the Ecclesiastical Province of the Roman Catholic Archdiocese of Lingayen-Dagupan. The 57,840 Catholics is under the care of Rev. Fidelis B. Layog, assisted by Rev. Isidro Palinar, Jr. the Spanish-colonial-era Church was declared a National Cultural Treasure by the National Museum of the Philippines and the National Commission for Culture and the Arts. Built in several stages from the 17th to 19th centuries by the Dominicans, the 17th Century Calasiao Dominican Provincial chapter church under St. Pauls patronage became Sts. Peter and Paul Parish under Fr, juan Maldonado de San Pedro Martin as parish priest after 1621. In 1763, Filipino rebel Palaris burned the church, Bishop Miguel Garcia de Nueva Segovia presided over the 1773 Synod of Calasiao at the sprawling Convento. Archbishop Basilio Sancho de Santa Justa y Rufina convened the Council from May to November,1771, Calasiao had a new church of 3 naves with a bell tower. But in 1841 to 1842, this church was destroyed and rebuilt by Father Dalman in 1852, the March 16,1892 earthquake damaged the church. Bonifacio Probanza left Calasiao in 1898, the 1936 Christ the King saw a new church. Ungson reconstructed the churchs and restored the front wall, antique statues. Juan Bello, Fathers Benigno Serafica, José Ferrer and Msgr, oscar Aquino under Bishop Jesus Cabrera. The present Parish Priest is Fidelis B, luis Ungson is assisted by Fr. Jose R. Carino and Allen O. Romero, at present, the church owns fully automatic bells or chimes which could be heard within 7- or 8-kilometer radius. Calasiaos prioririty status is due to its representation of various regions across the nation. Its 5-storey octagonal brick tower with architectural designs that slightly resemble those of the Southeast Asian Hindu-Buddhist Pagodas is 30 meters high. The prized original retablos is ornately decorated with statues of saints, the Baroque-style carved, the painted ceilings and the magnificent overall exterior are preserved for centuries. Close-up view of the National Historical Commission of the Philippines (NHCP) marker near the Rizal Monument, Manila, Philippines. The painting of Our Lady of Consolation at the apex of the reredos. The 1619 mural detailing Minalin, Pampanga during that period. The Finding in the Temple stained glass window manufactured in Germany by the Heinrich Oidtmann Company. The original campus of the University of Santo Tomas in Intramuros. Top view of the Arch of the Centuries. Cape Bojeador Lighthouse during construction in the 1890s.